When one thinks of Paris, it’s hard not to think about fashion, art and style. Unfortunately, many people seem to associate Paris shopping with only the expensive designer shops on the Champs-Elysées, often overlooking the smaller independent boutiques carrying the creations of talented French designers. In my opinion, there’s nothing better than finding truly original gifts for friends that I can honestly say are made in France, but I can sometimes spend days scouring the city for that rare gem. That’s why I was so happy to stumble upon Hôtel Bohême: a free weekend event showcasing the work of mainly French (and a few other European) creators and designers. Started in 2004, Hôtel Bohême currently takes place in a beautiful hôtel particulier in the 2nd Arrondissement of Paris, not too far from the metro Bonne Nouvelle. Like many people, I am in love with Parisian architecture and will jump at any opportunity to explore a divine old building like this one, especially when I can combine it with shopping! A large winding staircase (decorated with bright neon intertwining yarn) took me up to one of the three floors that had been completely taken over by a creative spirit. As I entered each room, it felt like I was paying a visit to a friend’s apartment, as the mood was relaxed, inviting and convivial. Jewelry by Les Curiosités d’Elixir. 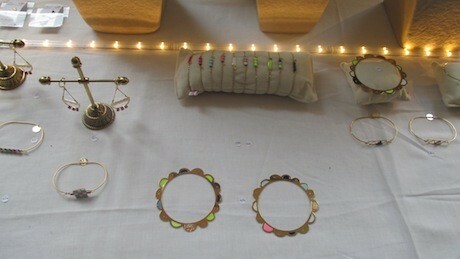 With 44 vendors present, there was a huge selection of items including home decor, jewelry, clothing and leather goods. Objects changed as I walked from room to room, with pastel cushions, stacks of pottery and polka-dot lampshades being replaced by button pendant necklaces and braided silk headbands. Although there was a definite girlie feel to this event, there were still great gifts for guys to be found, such as intriguing cuff links made out of the inner workings of old watches! There was even a salon de thé on the first floor selling Lov Organic teas and various pastries, cakes and savory treats. 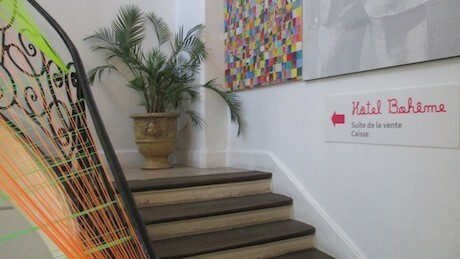 While I can’t describe every delightful object I saw at Hôtel Bohême, here are the top three designers that stood out. This collection of fun and playful jewelry immediately caught my attention along with the friendly personality of the Marseille-based designer. 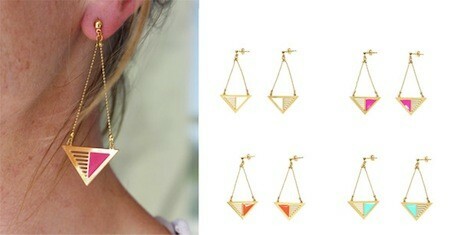 All designs are drawn by her and largely combine gold-plated brass with colorful enamel in various geometric forms. Little string bracelets with individual charms (20 euros each) also caught my eye and make a perfect affordable gift for any girlfriend. I bought a pair of cute heart-shaped earrings that I love! Earrings by Les Curiosités d’Elixir. 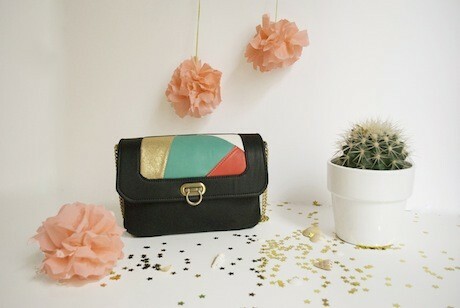 With her atelier based in Paris, this designer’s handbags were definitely the nicest I had seen in a long time. A rainbow of soft leather satchels along with some slightly more fancy handbags with exterior leather printed panels and chain straps definitely drew a crowd. This bubbly designer explained to me that she recovers pieces of imprinted leather (some from Chanel!) and various fabrics (for the linings) to make each handbag one of a kind. At around 130 euros each, I am definitely thinking of getting one! 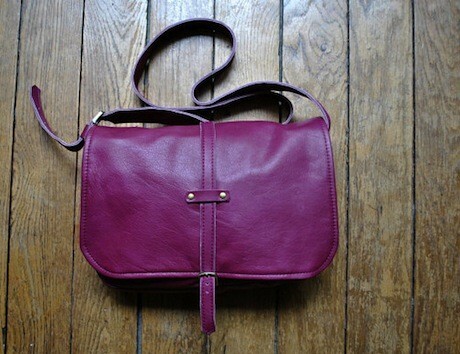 The Jeanne handbag by La Baïta. If you’ve never heard of binchō-tan charcoal (the result of slowly burning ubamegashi oak), as I hadn’t, then you’ll be equally amazed by these beautiful treasures made from the ebony-colored substance that is featured in this entire collection, and which is perfectly highlighted by gold and silver accents. 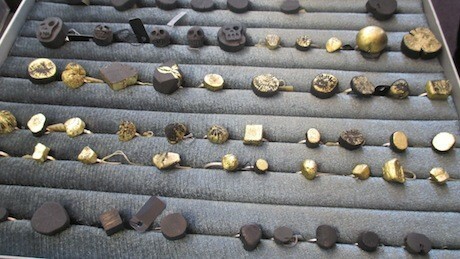 The charcoal is shipped from Japan, and all the jewelry is then carefully created in the Paris atelier of the designers. The event runs four times a year, so it’s best to check out its website in order to plan a visit. The next date that Hôtel Bohême will open its pale mint green doors will be the weekend of May 17–18, 2014. Don’t miss out on this cool and unique event! For more great ideas on where to go and what to do in Paris, get the GO-Card—everything you want to know about how to eat, live, play and stay in Paris for less! 6, rue Beauregard, in the 2nd Arrondissement.